SAMPURNA is a unique specialist fertilizer consisting of Organic carbon, Organic Booster like amino acids, effective AIMS ( Agriculturally Important Micro-Organisms) like Nitrogen fixing bacteria, Phosphorous solubilising bacteria and also trace amounts of essential minerals. 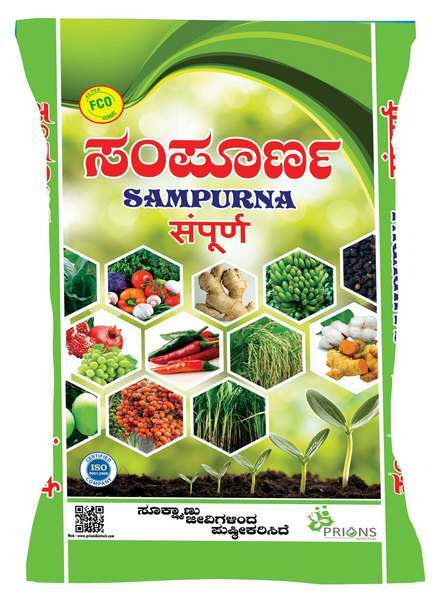 SAMPURNA intended to provide most comprehensive crop nutrition which improve Physico-Chemical and Biological properties of soil ecosystem, while enhancing crop productivity. SAMPURNA complies the FCO specification. 2 to 3 bags per acre. Cotton, Paddy, Wheat, Sorghum, Maize, Sunflower, Ground nut, Potato, Mustard, Pulses, Soya bean, Sugar cane etc. Banana, Mango, Grapes, Guava, Sapota, Pomegranate, Custard apple, Orange, Citrus fruit etc. Tomato, Chilli, Brinjal, Onion, Okra etc. 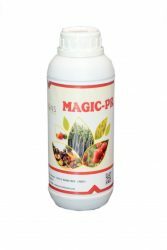 Humizyme-PR, rich in Humic and fulvic acid is manufactured using oxidative fermentation process and is enriched with PGR’s. Humic and fulvic acids are the most characteristic compounds of soil humic substances and the primary constituents of organic matter of the soil apart from high carbon supply. Increases primary and lateral roots. 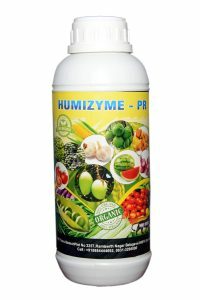 Humizyme-PR helps to improve the soil structure by reducing the loss of nutrients. 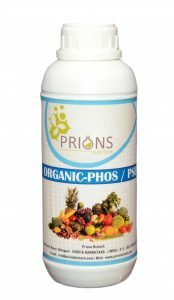 Neutralizes the acid and alkaline soils by regulating the pH values. Promotes seed germination and acts as an organic catalyst stimulating root growth, and permeability of plant membranes. Promotes the intake of nutrients, increases vitamin contents in plants and enhances the resilience of crops against cold, drought, pest, disease and toppling. Enriched with animal dung, agricultural wastes, JEEVAMRUTHA, PANCHAGAVYA, AZOLLA, VERMI COMPOST, SLURRY. Useful for all kinds of lawn, floriculture, horticultural crops like fruit crops & vegetable crops resulting in lush green lawn, enhances flowering, greener glossy leaves and improves shelf life of flowers remaining fresh for longer hours. Prevents soil from becoming hard and improves water retention capacity of soil. Keeps plants free from pest infestation and diseases. Care Instructions: Store in cool dry place away from direct sunlight; Precaution: Avoid using chemical fertilizers, pesticides and insecticides for 15-20 days before and after application of Grow more Garden manure and avoid mixing antibiotics, pesticides and insecticides with Grow more garden manure. 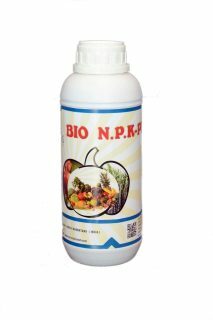 Specially formulated for better growth, Flower and quality fruit produce, this product contains all the nutrients required to the plant. Better growth, Flower and Fruit Formation and improved quality. Acts as an organic catalyst that stimulates root growth and helps in cell division. Improves nutrient uptake which leads to better synthesis of chlorophyll. 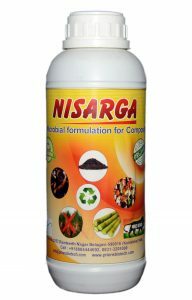 NISARGA helps in quick decomposition of leaves, small twigs and other litter material such as coffee berry husk without any loss of nutrients especially nitrogen. It also helps in narrowing down the C:N ratio. A variety of cellulolytic and lignolytic fungi, bacteria and actinomycetes are combined in this formulation. Application Method : The material to be decomposed should be spread in a bed to the height of six inches under shade. This should be moistened with water or cow dung slurry and then NISARGA mixed with enough quantity of water may be sprayed or sprinkled over the leafy materials. Again another layer is laid over this to a height of six inches and the same procedure is repeated up to 3-4 feet height. This may be covered with mud or cow dung slurry. The bed should be moistened at least once in 2 days. In 45-60 days the decomposition process will be completed and the compost is ready for field application. 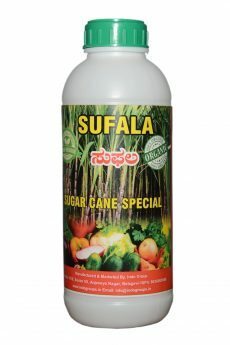 Sugarcane Special is enriched with all types of plant nutrients for overall development of Sugarcane. Promotes sugar synthesis & its translocation to storage tissue. Promotes root penetration and proliferation. Photosynthesis, carbon assimilation & translocation of carbohydrates. Imparts resistance against pests & disease attack and lodging. Regulates stomatal opening & closing and thus maintains turgor pressure under unfavourable soil moisture conditions. Elongation, increase in girth & weight. Influences growth, yield & quality. 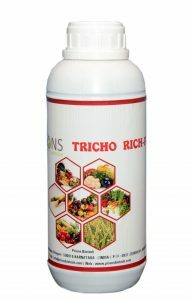 Tricho Rich-PR contains Trichoderma Viride an antagonistic fungus that protects the plant roots from soil pathogenic fungi like Rhizoctinia sp. Pythium and prevents major diseases like Stem rot, root rot, Damping off etc. Produces antifungal enzymes like Chitinase, protease and toxins. 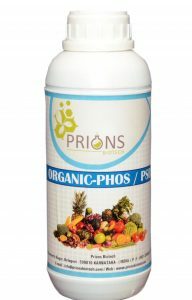 ORGANIC –PHOS bacteria converts unavailable phosphorous into available phosphorous and make it available to plant. These bacteria are use full for all crops. Drenching: Ratio 1:100 PSB mix to the 100 Lit water and apply this mixture through drip per 01 Acre. 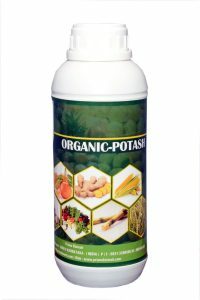 ORGANIC- POTASH is a bio fertilizer based on the selective strain of potash solubilizing frateuria. bacteria. The cells of frateuria aurantia contained in the product on reaching the soil gets activated and produce fresh batches of active cells. These cells grow and multiply by utilizing the carbon source in the soil or from the root exudates during their growth. They solubilize the feed potash in the soil and make it available to the plant in an easily usable form. 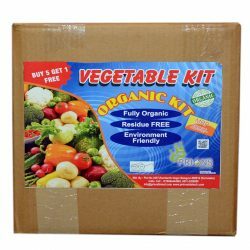 Bio organic kit consists of essential micro organisms which is required to mobilize the nutrients to the plants. 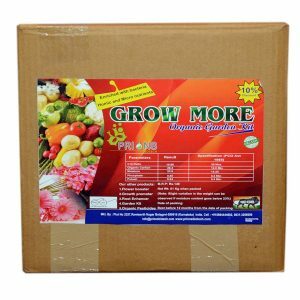 Helps in overall improvement of the plant and to get more yield by maintaining the soil health. BIO-NPK is a microbial formulation containing strains of bacteria able to synthesize/assimilate atmospheric nitrogen, solubilizes phosphate and potash into available form, thereby supplementing balance nutrition to the crops. It converts non available forms of micro nutrients into available form. Photosynthesis, carbon assimilation & translocation of carbohydrates, increase in girth & weight.